Personal injury claims are filed on behalf of individuals who were injured due to the negligence of someone else. 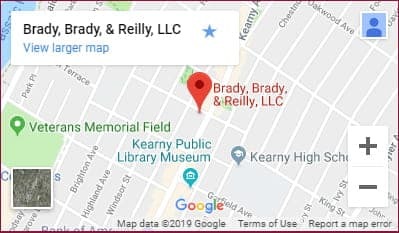 At Brady, Brady & Reilly, LLC, our experienced Hudson County injury attorneys have handled accident claims on behalf of New Jersey residents since 1965. We are dedicated to obtaining the best possible outcome for injured accident victims. Distracted driving has especially become a problem: in 2015, more than 300,000 people were injured, and nearly 3,500 were killed due to texting and driving. Due to this breach, the victim suffered damages (such as medical bills). Each of these elements must be proven for a motor vehicle accident claim to move forward in the New Jersey court system. Without one of the above elements, the claim fails and the victim is solely responsible for costs associated with the accident. Premises liability claims are filed when someone is injured on someone else’s property. For example, a slip and fall in a grocery store may lead to the filing of a premises liability claim. In these claims, the injured victim alleges that the property owner knew or should have known about a hazardous condition, but failed to remedy that condition. A common example is a spilled beverage in a grocery store that was not cleaned up right away, causing a shopper to slip and fall. The victim suffered damages, such as medical bills. A primary consideration in premises liability claims is how long the hazard was present on the property. For example, consider a cracked tile in a hotel hallway. The tile is a trip hazard. If the tile had cracked just an hour or so before the injured victim fell, the hotel may be able to avoid liability for the victim’s injuries. However, if the cracked tile was present for several days or longer and other hotel guests had reported it to hotel employees, the hotel was on notice of the hazard and may be liable for the victim’s injuries. Depending on the facts of the claim, one or more of these individuals may be liable for an accident. At Brady, Brady & Reilly, our Hudson County personal injury attorneys are compassionate and hardworking. We are proud to serve Jersey City, Kearny, Hoboken and surrounding areas. Whether your case settles out of court or goes to trial, we are prepared to fight on your behalf. To schedule a free consultation and case review with our firm, call 201-997-0030 or contact us online.